A range of twin wheel castors, ideal as furniture castors, or for equipment and office chairs. These twin wheel castors are available with either an M8 or M10 threaded stem for easy attachment. We can offer you a range of sizes in these plastic twin wheel castors from 40mm diameter wheels, 50mm diameter twin wheels, and up to 75mm diameter wheels. These versatile twin wheel castors can be found on office equipment, point of sale equipment, trolleys and as furniture castors. 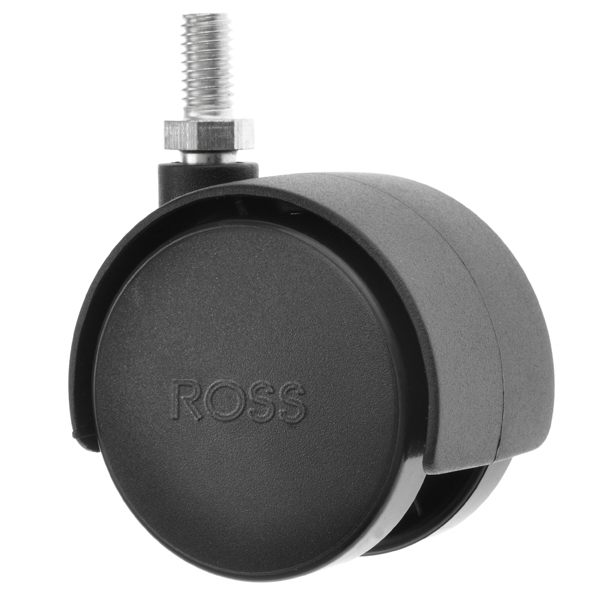 These furniture castors can also be offered with footbrakes, if you require your equipment to stay in position once attached.To aid attachment you can choose from our range of M8 and M10 Wood Inserts, Tee-Nuts and Weld on Nuts. For more information click on the product code.